Hi all , in the process of buying a bandit 1200s 55 plate from a dealer. On the test ride it went like a train but idling is an issue. It 'hunts' erratically from 500 to 2500 revs. 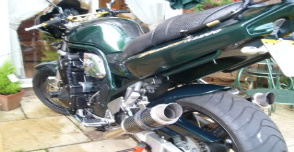 Dealer is currently looking at the issue and has remove the carbs 4 times and replaced seals and needles floats ect . still no joy. Also found the valve clearances were tight and could not get a feeler gauge under them so sorted that. Problem still there! now hes looking at the head gasket! think its broke between two cylinders and loosing vacuum? Is it time to walk away from the deal or wait to see if he fixes it??? been 3 weeks now getting miffed!